"I have long awaited this and you. White Wolf." Sideshow, Prime 1 Studio, and CD PROJEKT RED are proud to present Eredin Breacc Glas from The Witcher 3: Wild Hunt. The name of the King of the Wild Hunt, the identity of the lord of nightmares, the being behind the frightful mask, this long remained unknown. Over time, however, scraps of information gradually coalesced into a full likeness of our foe - but did nothing to detract from the terror he inspired. The Wild Hunt was in truth an elite cavalry brigade from the world of the Aen Elle, the Alder Folk, and was commanded by their ambitious and ruthless king, Eredin Breacc Glas. He would travel via secret paths through the cold emptiness between his world and ours to capture victims and take them back to his homeland as slaves. His current Hunt was Cirilla whose power he wanted to harness for his own uses. But his only obstacle in his path is Geralt of Rivia. 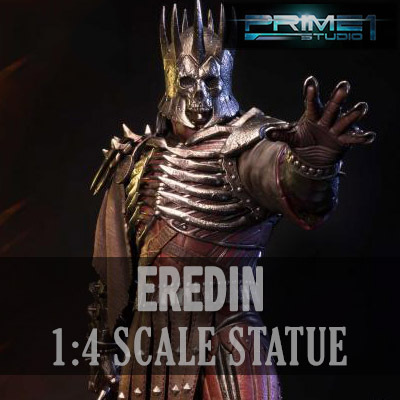 The Eredin 24-inch statue is accompanied with his hound.